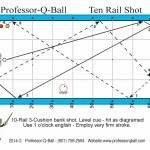 In this issue I want to describe for you an interesting jump shot that I discovered recently while playing around with my Eric Yow Jump Cue (now available online at www.JOERACKEM.com). 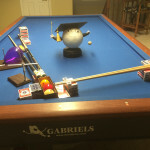 One thing I love about the game of pool is that it is always advancing in so many ways. 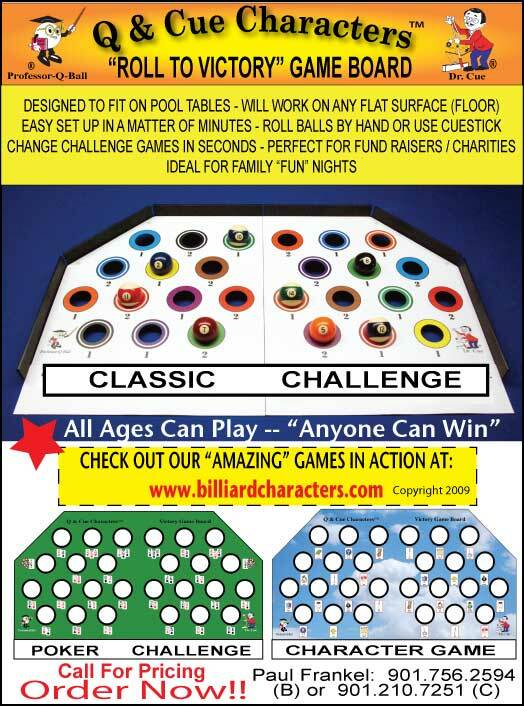 Technological advancements continue to improve the equipment we use, the tables we play on, and the tools we utilize. 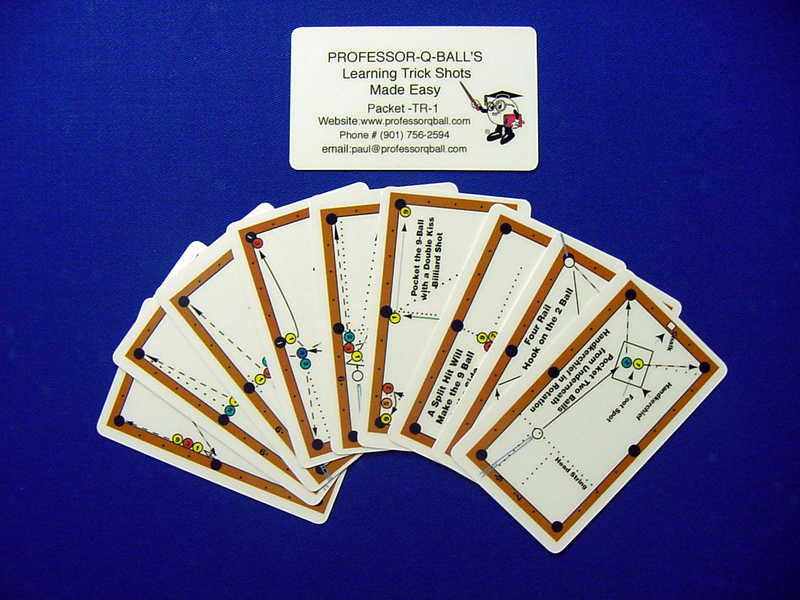 Also, as your abilities improve throughout your progress, you are able to learn new strategies, different shots, and different strokes that perhaps you didn’t know were possible. In artistic pool, we ‘create’ shots that others might have thought impossible or unlikely at best, then perform them for a live audience. 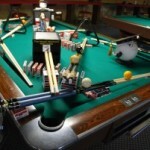 Some of these fantastic shots can be reduced to simple principles applicable to regular gameplay. 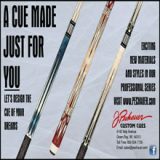 The big masse shots I shoot with the Eric Yow Masse Cue aren’t likely to come up in a game, but the simpler versions certainly will. 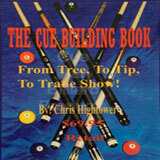 If you practice them, you will be glad you have the masse cue and the ability to make the shot, when it comes up. 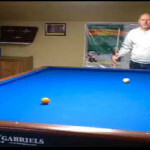 The shot I wish to teach you today is a shot that could easily come up in a game and is makeable with a few adjustments to fine tune your aim. 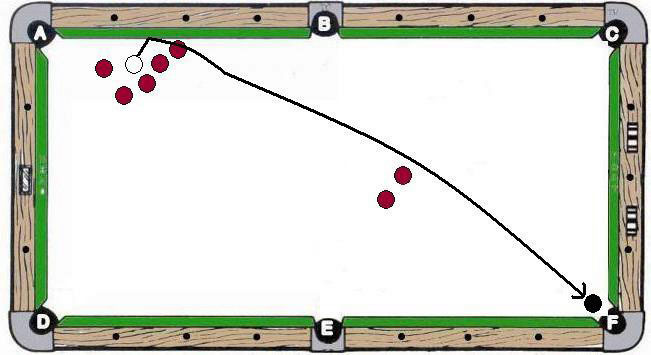 Here, we are combining a kick shot with a jump shot. 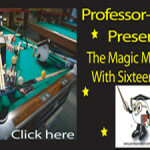 However, the physics involved is so much more complex than the mere geometry a novice pool player might consider. 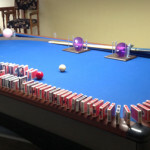 The cue ball is placed so that there is little room to effect a jump shot over the obstructing wall. 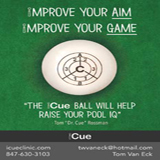 While the Eric Yow Jump Cue can jump a ball from as close as 1 millimeter away, most jump cues cannot, and it is not a practical shot when you want to get distance like we do here. 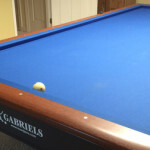 So, the answer to the riddle is to jump off of the long rail in such a way as to send the cue ball with a kick shot traveling all the way down table to the far corner to pocket a ball. What you must do first is find your aim point. 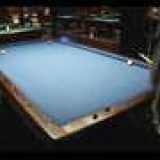 However, it is not the same aim point as an ordinary kick shot because the cue ball is in flight at the point that it strikes the rail. 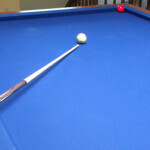 So, you need practice to gauge the height at the point of impact. 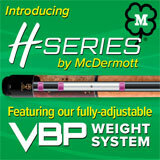 Practice with the exact same set up and the same elevation, perhaps a 45 degree dart stroke. 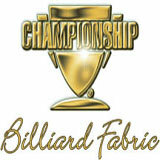 I place the cue ball one ball from the rail. 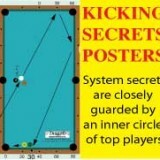 Use a center ball hit and strike with medium-soft power (or medium if you use a less effective jump cue). 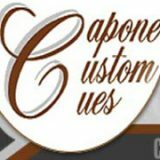 With a full cue, use a touch of follow or more elevation. 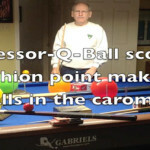 Practice hitting the rail just below the equator of the cue ball. You’ll also find you can use draw to curve around more objects on the table!